The 1950s were in many ways a prosperous time for the United States. The population was booming, the national economy was on the upswing, and more consumers were gaining access to goods and services that enriched their families’ lives. Just under the surface, however, lay growing concerns about the possibility of nuclear war between the highly polarized eastern and western blocs in the Cold War. When the Soviet Union detonated its first atomic device in 1949, U.S. policymakers and concerned citizens alike pressed for more preparedness for a potential nuclear blast within U.S. territory. The national Office of Civilian (Civil) Defense in Washington took on the primary role in developing programs to educate the public about the potential nuclear threat and coordinate local, state, and national efforts to prepare for it. In Florida, state government was highly involved as well. Logo of the Florida Civil Defense Council, adopted from its national counterpart, used in the 1950s and 1960s. 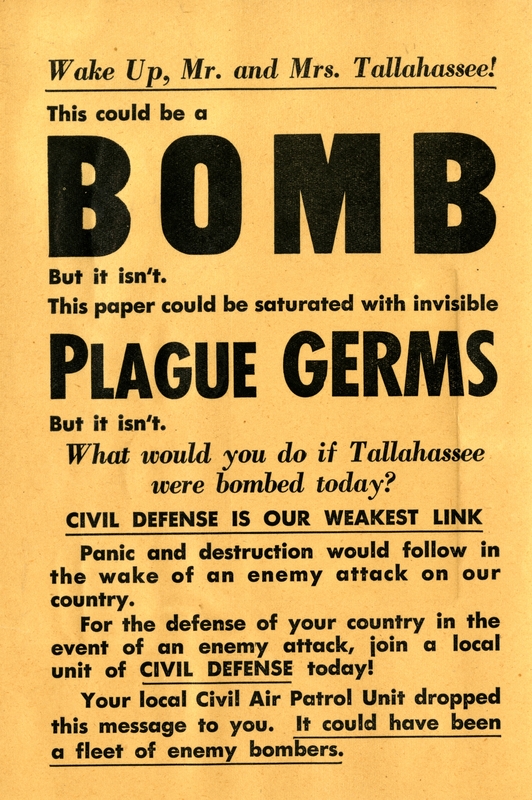 A broadside alerting citizens to the need for having a plan in place in case of nuclear attack (1954). A map of sites around the state for monitoring radiation levels in the event of a nuclear attack. This map was one of several included in the 1962 revision of the state’s Civil Defense Plan, which can be found in the State Documents Collection at the State Library of Florida. One of the main concerns was how to ensure the survival of the largest number of citizens possible during the actual nuclear attack. Although the images and reports coming from witnesses to the earlier Hiroshima and Nagasaki atomic bomb sites were less than reassuring, scientists and officials held out hope that an atomic blast was survivable if citizens were properly prepared and adequate fallout shelters were available. Consequently, civil defense agencies at the local, state, and national level began identifying existing structures that could be designated as fallout shelters, and planned for more to be built. Private citizens also began building fallout shelters of their own. An entire industry developed around providing consumers with the materials necessary to construct and supply these structures. Gilbert Chandler, Jr. emerges from a basement under the Tallahassee Motor Hotel on North Monroe Street. Civil Defense officials said 500 people could potentially take shelter in the space in the event of a nuclear attack (March 2, 1961). Aside from sheltering the population, governments also had to think about maintaining order during a disaster. In the event of a nuclear attack, state officials would need to be able to communicate with law enforcement and local governments across the state to coordinate their efforts once the attack was over. To ensure that the state government would remain functional during a nuclear emergency, Florida’s civil defense authorities established fallout shelters under both the governor’s mansion and the capitol building, complete with supplies of drinking water, food, and other necessities. Chlorine is added to water supplies at the fallout shelter in the basement of the old capitol building in Tallahassee. At left is Hal Miller, field operations officer of U.S. Civil Defense Region #3, based in Thomasville, Georgia. At right is Tallahassee city engineer Thomas P. Smith (February 15, 1962). Workers prepare to build thickened walls around the basement of the governor’s mansion in Tallahassee so it could be used for a fallout shelter. The man at right is Charles P. Walker, who had served as the superintendent of the executive mansion for 20 years when this photo was taken (December 18, 1961). Governor C. Farris Bryant tests an emergency radio system located in the fallout shelter located in the basement of the governor’s residence in Tallahassee. In the event of a nuclear attack, this shelter would have become Florida’s seat of government, and the radio system would have enabled communication between the governor and the State Highway Patrol, the Road Department, and other state agencies. This photo was taken around the time of the Cuban Missile Crisis (October 1962). Some shelters, such as this one planned for the Collins Building on Gaines Street in Tallahassee, never made it past the blueprint stage. A plan showing the basic concept of a fallout shelter to be built under the Collins Building on Gaines Street in Tallahassee. This shelter was never built (plan drawn up circa November 1962). Thankfully, aside from a few drills and the drama of the Cuban Missile Crisis in 1962, these shelters were never needed for their intended purpose. Many were later remodeled for storage or other purposes. A few still remain, however, and they remind us of how seriously the danger of nuclear war commanded the attention of Floridians living during the Cold War. Do you know of a former fallout shelter still in existence somewhere in Florida? Did you ever participate in a drill that involved going into one of these shelters? Tell us about your experience by leaving a comment. A friend had one built on their property on the NE side of town (Perry). We would play on and around the mound of dirt that topped it but I don’t recall being allowed inside. Property has long since been sold but this has me wondering how the current owners utilize the underground building. Our neighbors on Westridge Drive in Tallahassee had one in their back yard. I would bet it is still there. There’s a old fallout shelter on both Monroe under the parking lot of the current Joe Mama’s pizza. It’s used for storage now. Does anyone remember tanks rolling in Tallahassee. I was only 3, going on 4, but I remember tanks and trucks with missiles. We have one in our backyard in the Old Town section of Tallahassee!